I enjoy writing to give other people pleasure. I love traveling, eating out, finding fabulous cultural events at home and afar. I hope you'll like and try some of my discoveries, and favourite places and experiences. 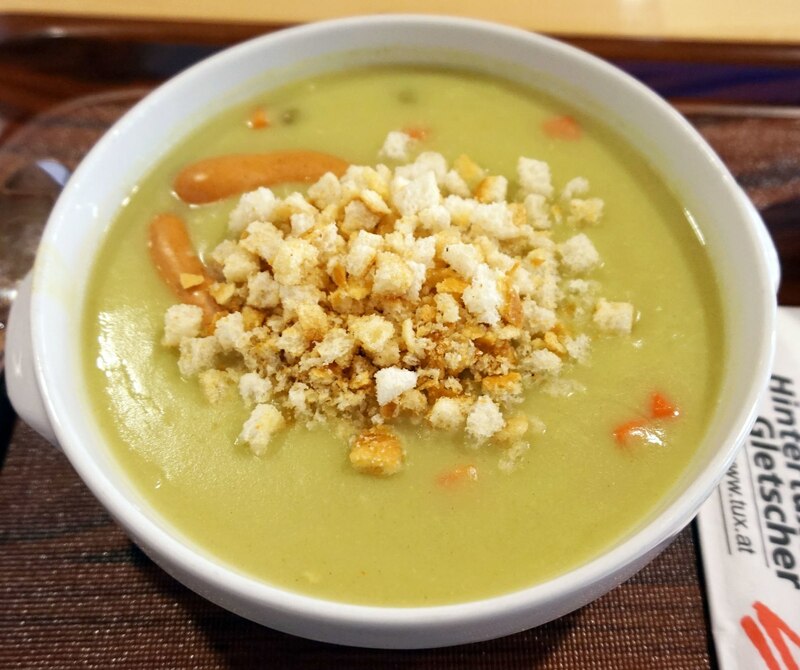 There's nothing like a nourishing soup filled with vegetables, meat and spices to warm both your belly and your heart on these cool autumn nights. I like to use recipes as a base then add my own creative flourishes based on what is in my fridge and pantry, and what taste combinations seem scrumptious to me at the time. I LOVE cooking and have many years experience with experimenting, so have the confidence to come up with my own creation, but I often still like to do a little research first. Here's a week's worth of my favourite soups that you might like to try. I've started on Sunday, so you can be ready with ingredients and a bit of extra time. You might like to go to fresh produce markets on Saturday and to the Asian grocery store to stock up. These recipes should all serve at least 4 people or provide your lunch for the following day. 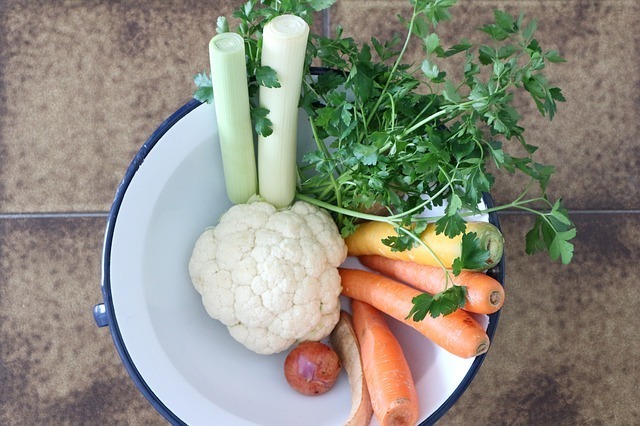 This cauliflower soup recipe includes lots of options for you to choose from. If you have time and feel like it, you can also cook the muffins to go with it. Toast is just as good if you are time poor. 1. If cooking muffins, preheat the oven to 180°C. Line 2 baking trays with foil. Have all muffin ingredients prepared before starting soup. 2. Heat oil in a large saucepan over medium heat. Saute onion and garlic (and celery), stirring, for 3-4 minutes until softened. 3. Add stock, bay leaf and cauliflower (reserve ¼ of cauliflower if cooking bacon) (and carrot, potato), bring to the boil, then reduce the heat to medium-low and simmer for 12-15 minutes or until cauliflower (and potatoes) are tender. 4. If making muffins, cook these while soup is simmering. 5. If you use the beans, stir them through at this point. 6. Remove from heat, cool slightly. Remove and discard bay leaf. 7. Using a hand blender, process until smooth and thick. 8. If using cream, stir through at this point. 10. Meanwhile, place the bacon and remaining cauliflower on one of the lined baking trays. Season with pepper, then drizzle with remaining 1 tablespoon oil and sprinkle with 2 tablespoons parmesan. Roast for 10-12 minutes or until crisp. Put the bread rolls on a separate tray, sprinkle with remaining 1/3 cup (25g) parmesan and bake for 2 minutes or until golden. 11. Reheat soup when ready to serve. 11. Serve with bread rolls or carrot and zucchini muffins (recipe below). 1. Adding a can of white beans to blended soups gives a thicker and creamier consistency without adding milk or cream. 3. Pumpkin, sweet potato, leeks, shallots, rosemary, paprika, curry powder and coconut cream can all be substituted to cook a delicious cauliflower soup. You could also substitute the bay leaf with some coriander, cumin and chilli powder. 2. Sift flour, sugar, soda and cinnamon into the basin. 3. Mix in carrot, zucchini and pecans. 4. Make well in the centre of dry ingredients. Add lightly beaten eggs, milk and butter, mix well until ingredients are just combined. Pour mixture into muffin tins. 5. Bake in the oven for (approx) 20 minutes. The idea of muffins sounded like a complete meal so I added that too, modifying this recipe: https://www.chefdehome.com/recipes/760/zucchini-carrot-muffins. Mmmm, this is one of my favourites. You can substitute pumpkin for the sweet potato, or even better, use both! 1. Heat olive oil in a large saucepan over medium heat. Add the onion and cook, stirring occasionally, until translucent and cooked through. Add the garlic and ginger and cook for a minute. 2. Add the Thai red curry paste and cook until onions, garlic and ginger are coated and you can smell the curry paste, 30 seconds-1minute. 3. Add the sweet potato, carrots, stock, lentils, lemongrass, kaffir lime leaves, turmeric, fish sauce and lime juice. 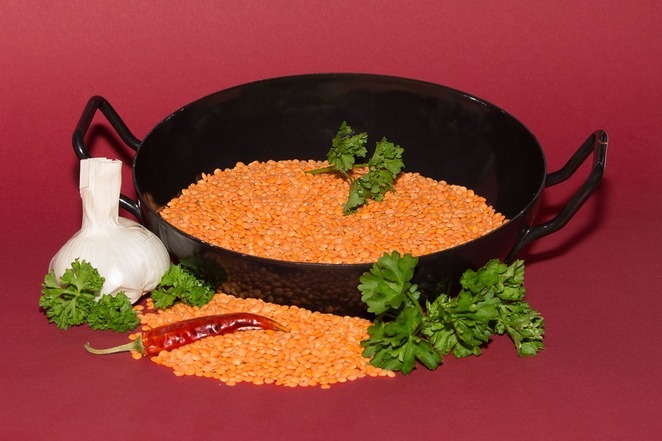 Cover, bring to a boil, reduce heat, and simmer for 20 minutes until lentils and sweet potato are soft. 4. Remove lemongrass and kaffir lime leaves. 5. Add salt and stir in coconut milk. Cook five more minutes. 7. Add salt and additional lime juice and fish sauce to taste. 8. Garnish with kaffir lime leaf slivers and coriander, and a drizzle of coconut milk. For one of my big birthdays (I'm not telling which one it was), I had a Moroccan themed party. This is the soup I served. 1. Heat half the oil in a frying pan, season the thighs and brown well on both sides. Remove to a plate. 2. Tip a mug of water into the pan and simmer, scraping up all the browned bits. Tip this liquid into a measuring jug for later. 3. Put the remaining oil, the vegetables and coriander stalks in a big saucepan. Gently cook until the veg is softened – about 5 mins. 4. Stir in the spices, turn up the heat, and cook for a few mins. 5. Stir in the harissa, followed by the tomatoes, the chicken, stock cubes and lentils. 6. Top up your jug of chickeny juices to 500ml with water, then add this, too. Bring to a simmer, cover and cook for 30 mins. 7. Lift the chicken from the soup and shred finely using a couple of forks. Return to the soup with the lemon zest and juice, sugar, and season to taste. 8. Ladle into bowls with a dollop of yoghurt and the coriander leaves, and serve with toasted pita or Turkish bread, spread with houmous and drizzled with oil. I created my own Moroccan recipe book a couple of years ago after many hours spent sourcing the very best of many recipes online and combining them to suit my taste. 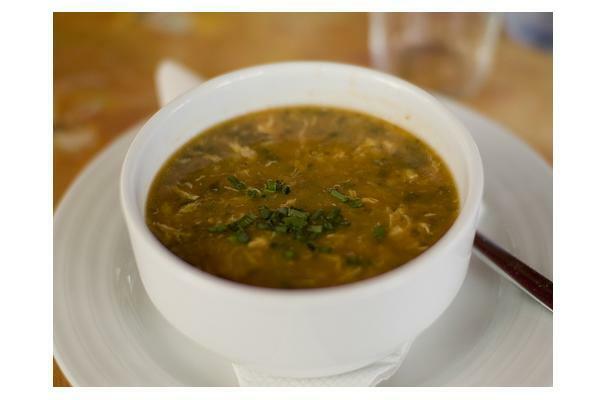 The recipe below is from my book but here is an online recipe source which I may very well have originally referred to: https://www.bbcgoodfood.com/recipes/moroccan-harira-chicken-soup. 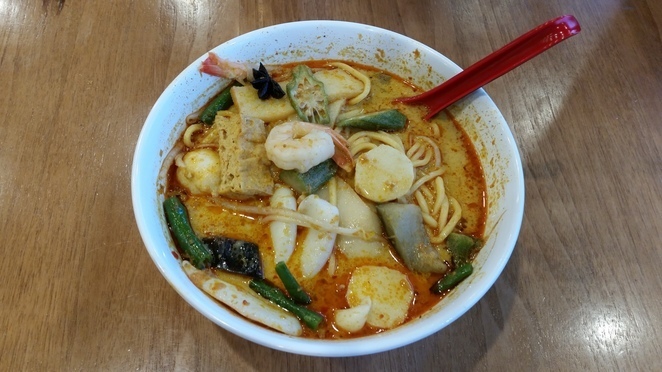 Laksa varies greatly depending on which country and region you are in. I like a good Malaysian Seafood laksa recipe. My husband doesn't eat seafood so always asks for chicken laksa. So here are both variations for you. 1. Grind coriander, peppercorns, cumin seeds, fennel seeds, cloves, turmeric and chiles coarsely in a spice grinder; set aside. Peel tough outer layers from lemongrass, then mash core with a meat mallet or small, heavy frying pan. 1. Heat oil in a large pot over medium heat. Add chicken, shrimp paste, shallots, and reserved ground spices and cook, stirring constantly, until fragrant, 2 minutes. 2. Pour in coconut milk, stock, sugar, and salt; add beans, mushrooms, okra, cinnamon stick, fish sauce, kaffir lime leaves, lime juice and lemongrass. Bring to a boil, then simmer, covered, 20 minutes. 3. If using prawns instead of chicken, add them in to simmer for the final 2 minutes of cooking. Don't boil or cover the pot. 4. Cook wide noodles in a pot of boiling water until firm, 4 minutes. Drain; rinse well. 5. Soften vermicelli noodles by soaking in hot water for 2 minutes or until soft. 6. Divide tofu, sprouts and noodles among bowls. Ladle in soup (remove cinnamon and lemongrass) and garnish with some of the tofu, mint, coriander and a few of the bean sprouts. Serve with limes and sambal. 1. Find shrimp paste in the Asian-foods aisle of a well-stocked grocery store or at an Asian market. 2. You can either serve with the sambal or fry the ground spices in the oil before adding the meat and other ingredients in step 1. above. As well as my trusty recipe books and lots of experience, I when making my laksas I use some of these as a basis: www.myrecipes.com/recipe/chicken-laksa, https://www.chefdehome.com/recipes/717/laksa-soup, https://en.wikipedia.org/wiki/Laksa. The recipe for the sambal oelek chilli paste is in one of my recipe books: "bowl food: the new comfort food for people on the move" (2002, Murdoch Books). Pea and ham soup bring back warm childhood memories for me. I prefer green peas rather than yellow. How about you? This soup takes some preparation time so you might like to start it a couple of days before you intend to eat it. You will need to soak the peas for at least 6 hours and the cooking time is about 2 hours. It seems to get thicker and become tastier if you eat it the day after you cook it. 1. Place split peas in a large bowl, cover with cold water and soak for at least 6 hours. 2. Place the butter in a large soup pot over medium-low heat. Stir in onion, celery, carrot and garlic. Cook slowly until the onions are translucent but not brown, 5 to 8 minutes. 3. Mix in ham, bay leaf, thyme and split peas. Pour in chicken stock and water, stir to combine, and bring to the boil. Reduce heat and simmer slowly, stirring occasionally, until the peas are tender and the soup is thick, about 1½ to 2 hours. 4. Discard the bay leaf and sprigs of thyme. Remove the ham bones from the soup and cool slightly. Remove the meat from the bone, discard bones and chop the meat. Return the ham to the soup and reheat. Season with salt and black pepper and lemon juice is desired and serve. 1. For a finer texture, the soup can be cooled and processed before returning the meat to the pan. 2. Try a heartier variation by adding sliced frankfurters or spicy smoked sausage in the cooked soup. Many years ago a friend gifted me with a terrific cookbook, "bowl food: the new comfort food for people on the move" recipe book (2002, Murdoch Books). Although there are thousands of recipes for pea and ham soup, this was the main source I referred to for this recipe. Well, I ought say the book was on the table, although I have cooked this soup so often that I barely referred to it. 1. Preheat the oven to moderately hot 200 deg. 2. Heat the oil in a large saucepan and cook the onion and garlic over medium heat for 3-5 minutes. Add the beef, stock and 1-litre water and bring to the boil. 3. Reduce the heat and simmer, covered, for 1¼ hrs or until the meat is tender. Remove the meat. 4. Meanwhile, trim the beetroot just above the end of the leaf stalks. Wrap in foil and bake for 30-40 minutes, or until tender. Unwrap and leave to cool. 5. Return the stock to the boil and add the bay leaf, tomato, carrot, celery and potato, and season with salt. Cook over medium heat for 10 minutes. Add the cabbage and cook for further 5 minutes. 6. Peel and dice the beetroot. Return the meat to the pan and add the beetroot, lemon juice or vinegar, sugar and 1 ½ tablespoons each of parsley and dill. Cook for 2 minutes or until heated through. Season to taste. 7. Remove from the heat and leave for 10 minutes. Serve with a dollop of sour cream and garnish with the remaining dill and parsley. 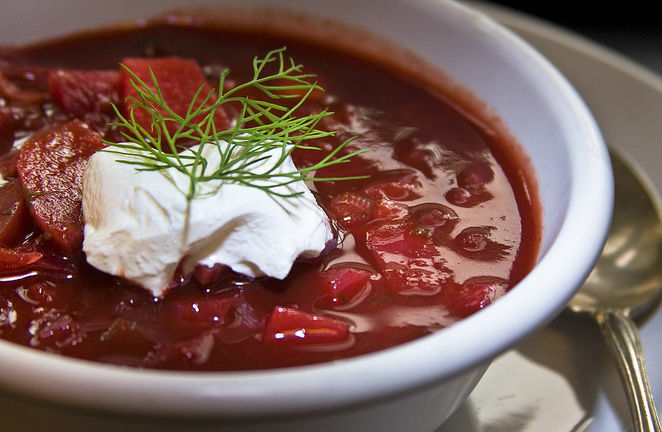 There are a variety of borscht recipes and recipes which are very similar. My wonderful recipe book "bowl food: the new comfort food for people on the move" recipe book (2002, Murdoch Books) was the main source I referred to for this recipe. The Tom Kha Gai soup I cooked at a Thai cooking class a few years ago was simple and superb. The flavour of galangal ("kha" in Thai) creates a heavenly taste when combined with hot chile peppers, coconut milk, lime leaves and lemongrass work very well in this coconut-based soup. One of my favourite versions of this soup is served with onion, mushroom and tomatoes so I've added these as optional extras. You can have this classic version which is a white soup or cook a little red curry paste in oil for a couple of minutes at the outset then begin from step 1 if you prefer the red colour and a little more spice. •	coriander (cilantro) leaves, shredded lime leaves and finely sliced chillis to garnish. 1. Heat the stock. Add the kaffir lime leaves, lemongrass, galangal or ginger, chillies, fish sauce, garlic, tamarind and lime juice. Cover and cook on a medium-low heat for 10 minutes so the spices can infuse the broth. 2. Uncover and stir in the coconut milk, fish sauce, soy sauce, onions, sugar, mushrooms, lime juice, tomato, mushrooms and chicken. Simmer for 5 minutes to heat the chicken through; season with salt and pepper. 3. Ladle the soup into a soup tureen or individual serving bowls. 4. Garnish with cilantro, shredded limes leaves and finely sliced chilli. Be careful to avoid chewing the lemongrass, ginger, or lime leaves. 1. Place the chicken and vegetables in a large stockpot over medium heat. Pour in only enough cold water to cover (too much will make the broth taste weak). Toss in the thyme, bay leaves, and peppercorns, and allow it to slowly come to a boil. Lower the heat to medium-low and gently simmer for 1 to 1 1/2 hours, partially covered, until the chicken is done. 2. As it cooks, skim any impurities that rise to the surface; add a little more water if necessary to keep the chicken covered while simmering. 3. Carefully remove the chicken to a cutting board. When it's cool enough to handle, discard the skin and bones; hand-shred the meat into a storage container. 4. Carefully strain the stock through a fine sieve into another pot to remove the vegetable solids. Use the stock immediately or if you plan on storing it, place the pot in a sink full of ice water and stir to cool down the stock. Cover and refrigerate for up to one week, or freeze. 2.	for vegetarians, replace chicken with vegetables such as green beans, carrots and baby corn. You can replace fish sauce with light soy sauce and chicken stock with vegetable stock. 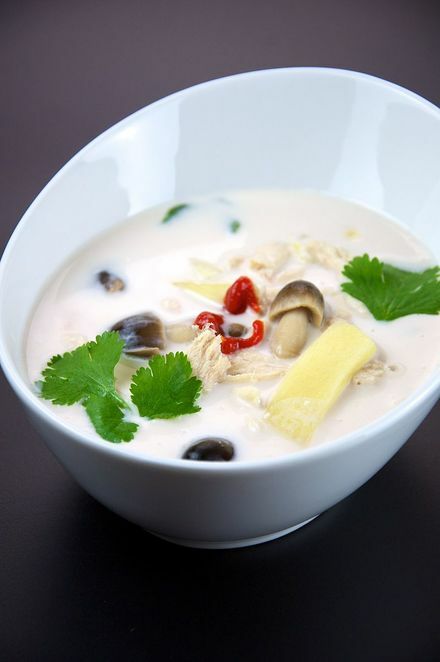 3.	the proportion of chicken stock to coconut milk can be changed according to your taste. The creamier you like it, the more coconut milk. Although I have browsed through many different Tom Kha Gai recipes, I continually go back to the photocopied one which I acquired at the cooking school in Chang Mai, Thailand as my base soup. Our teacher was a beautiful Thai woman called Meow Meow – yes, you heard it right! Well, there's a weeks' worth of delicious soups. Yum! Be creative and experiment when you cook, thinking about what you love the best and your soups will leave everyone nourished, healthy and happy. I have many more soup and other recipes to share so stay posted. Enjoy! Why? Who doesn’t enjoy finding a quick, easy, delicious, warming recipe?